I never hide my slightly biased preference towards foods with an inherent kick; robust flavours playing over this jaded tastebud, laden with strong spices and infused with fragrance from a mix of herbs; possibly indigenous to a certain God-knows-where village. Hence you won’t usually read about plain soupy noodles or porridge that much on this blog, in comparison to Indian cuisine or even Thai cuisine. 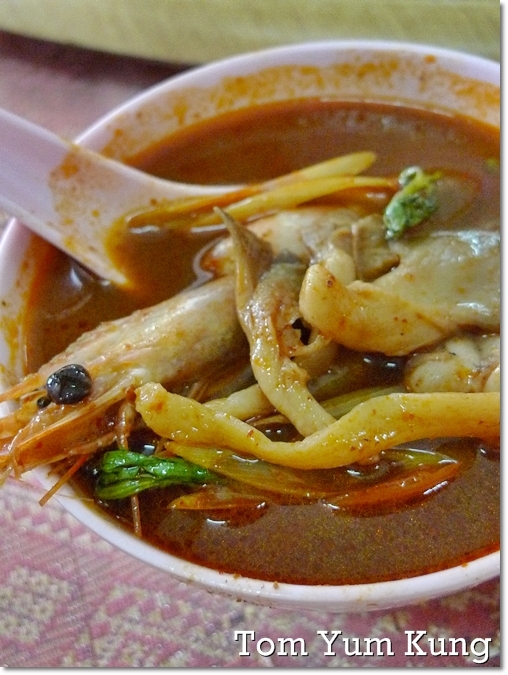 #1 – Thick, almost to a creamy extent Tom Yum with a tapered down spiciness; possibly to suit the local palates. Not the BEST out there, but definitely one of the better ones around. Unless you like your Tom Yum to be not as ‘murky’ and with a killer fiery kick. And thus, almost immediately after the long CNY break, we ventured to Section 5 of PJ for this hidden gem of a authentic Thai restaurant. Or so I was informed. 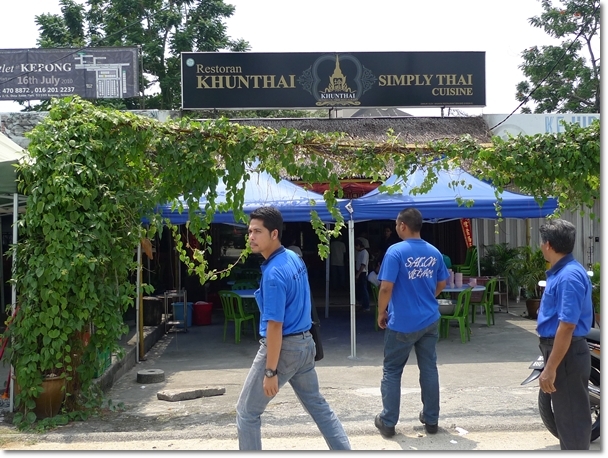 The name Khunthai did ring a bell, and a glance over the menu justified my suspicion. This Khunthai and the one in Butterworth (read the post HERE) are one of the same; and they also have another branch in Kepong. So let’s see how this sweaty (we chose to be seated in the non-air conditioned seating area because one of us was too busy contributing to air pollution ….) 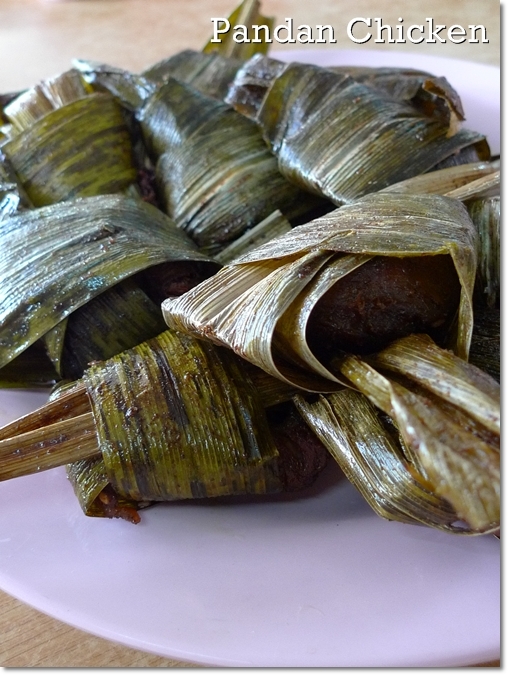 experience worked out against the more established (and definitely comes with a better ambience) Khunthai in Butterworth, Penang …..
#2 – Pandan Chicken – Wrapped in fragrant pandan (screwpine) leaves then deep-fried before serving on the spot. So you get crispy leaves, but try not to eat those. In case you like the taste of dry leaves. The chicken was okay, but did not register in my mind after the initial bite. 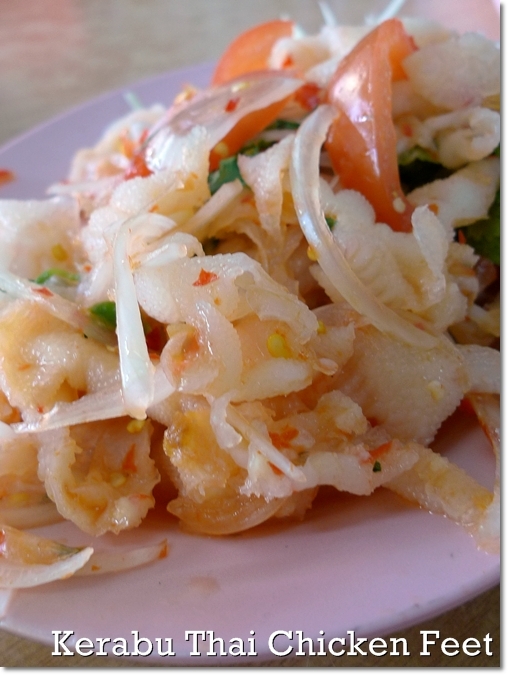 #3 – A famous Thai version of the salad; with deboned chicken feet tossed with onions and tomatoes, with a squeeze of lime juice, a dash of fish sauce perhaps, and lots of hidden fire power within; the bird’s eye chillies. However, this appetizer faltered miserably. 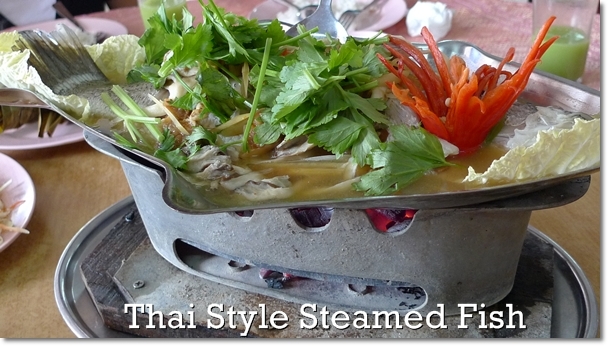 #4 – Thai Style Steamed Fish – We initially asked for the siakap, but the fish was all sold off. Hence they gave us some grouper (or was it?). You can (and really SHOULD) refill the gravy for the steamed fish; as topping up ensures the fish does not go dry from the continuous charcoal fire from beneath. 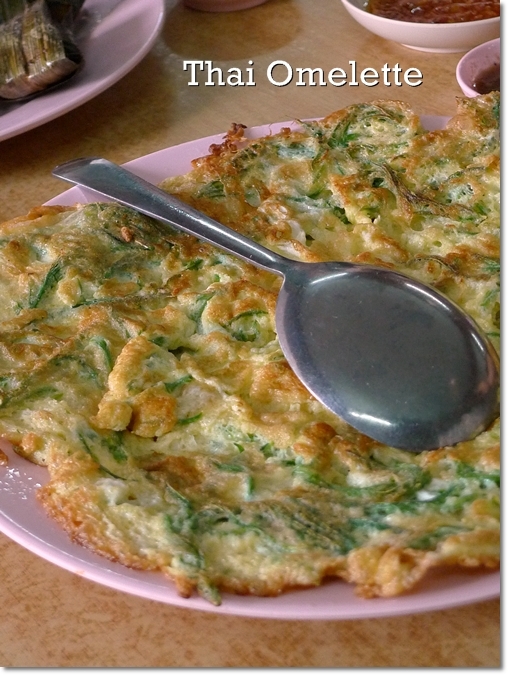 #5 – Thai Omelette with Basil – Simple, slightly greasy, but goes well with the sweetish chili sauce. Alternative of course, includes the oyster omelette or the one with prawns. 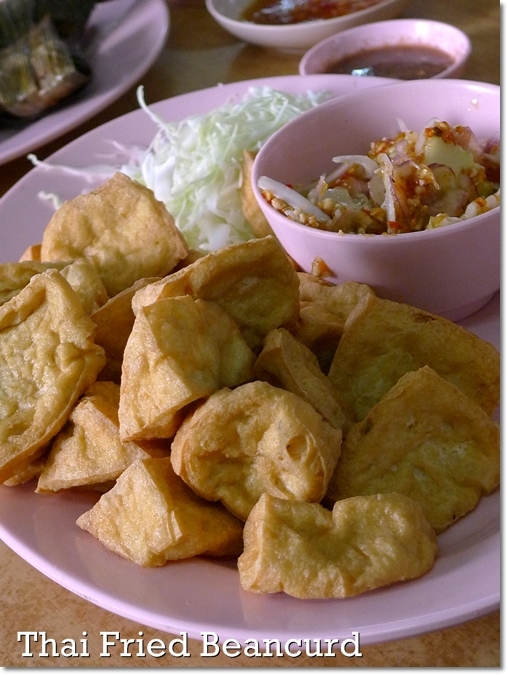 #6 – Thai Style Fried Beancurd – Served with a side bowl of erm … Thai salad? Combining various julienned vegetables (cucumber, onions) in a nutty Thai chili sauce. 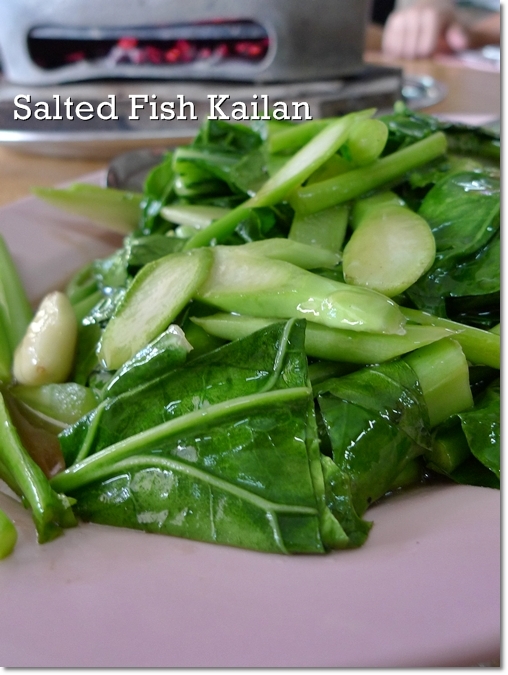 #7 – Stir fried kailan with salted fish – The fibres. Enough said. In fact, if compared to my personal favourite Thai food stall in Ipoh, this one fell short off the mark. To an even greater extent. Or maybe we did not order the right dishes? Heard that the fried chicken tendon is good, but they ran out of tendons that same day. Again … too bad. And no, they were NOT ambassadors for Khunthai. The meal came to quite a hefty sum for a simple Thai restaurant with an authentic touch, supposedly. Close to RM30/USD10 per pax, if I am not mistaken. I even took the liberty to lose the bill …….. Talk about the losing passion. Now I wonder, where should I head next to satisfy this incessant cravings for a good bowl of Tom Yum? Thanks J! Yeah, always resorted to the same old stuff in Bkt Bintang. The Magnificent Fish & Chips Bar was good, but not as stellar as expected. Wah you made it sound sooo nice lah. Damn, if only I stay somewhere nearer. I was just here on Sunday night. While it managed to put a lid on that crazy tomyam craving that night, it definitely was missing a lil something something. Gotta tip my hat off to the ever-smiling, super-efficient staff though! Yeah, staff was ever friendly. True, lacking in firepower perhaps … but least it’s better than most in shopping malls. Yeah, not cheap leh …. I was expecting about RM15-20 per person, but the price came to much more than that. The fish was RM40 or so. Motorman dear, where in your opinion is the best place that serves Chinese Tong Sui, particularly Fa Sang Woo, in KL or Ipoh. I just posted how I can’t find a good one and have to eat out of a jar of peanut butter. Fah Sang Woo in Ipoh I know lah … KL not sure. But along Jalan Imbi there got a stall that sells traditional tong sui. At night only. Famous for their peanut soup and the mua chee. On Jalan Queen in Pasir Pinji. Thanks motorman, I am still eating it out of my peanut butter jar as a substitute for the time being. Eh which one woh? Faster lah … you so busy with classes nowadays. Hmm. Their tomyam soup nothing to should about ler. Yeah loh …. I agree. But their outlet in Penang is much better.